[Updated] Police are responding to the Devonshire area tonight [Jan 29] to what we understand to be a shooting incident. Unofficial reports suggest that someone may have been injured. Details are limited at this time, however we will update as able. Update 12.12am: The road is blocked off by the round-a-bout on North Shore. We expect to receive a formal police statement shortly and will update as able. Update 12.52am: The police confirm that the shooting victim has died. Update 1.52am: Police statement at scene with Police Media Manager Robin Simmons. 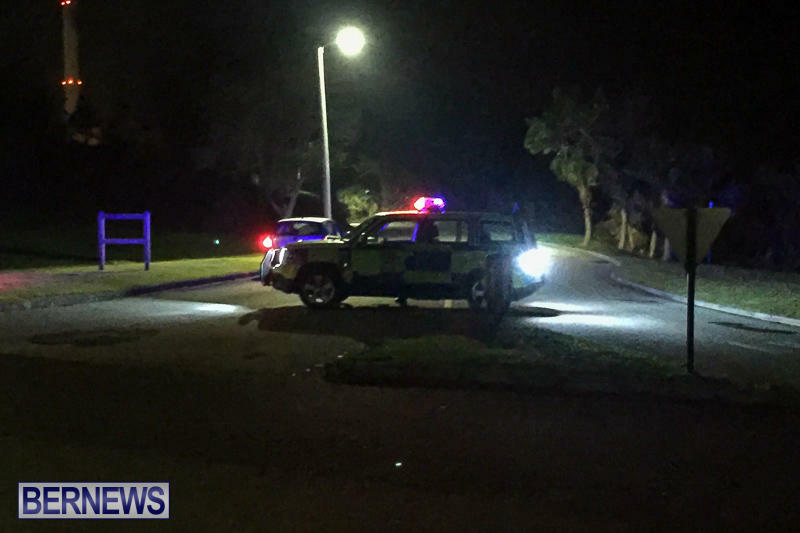 Update 2.17am: Police Media Manager Robin Simmons said, “Around 11:20pm on Sunday, January 29th police officers responded to a report of gunshots at Mid-Atlantic Boat Club on North Shore Road in Devonshire. “‎Initial information was that one person was shot and taken to King Edward VII Memorial Hospital via ambulance. “That individual, believed to be a ‎31 year old Devonshire man, later succumbed to his injuries. “No further information regarding the deceased will be released at this time, until next of kin has been informed. 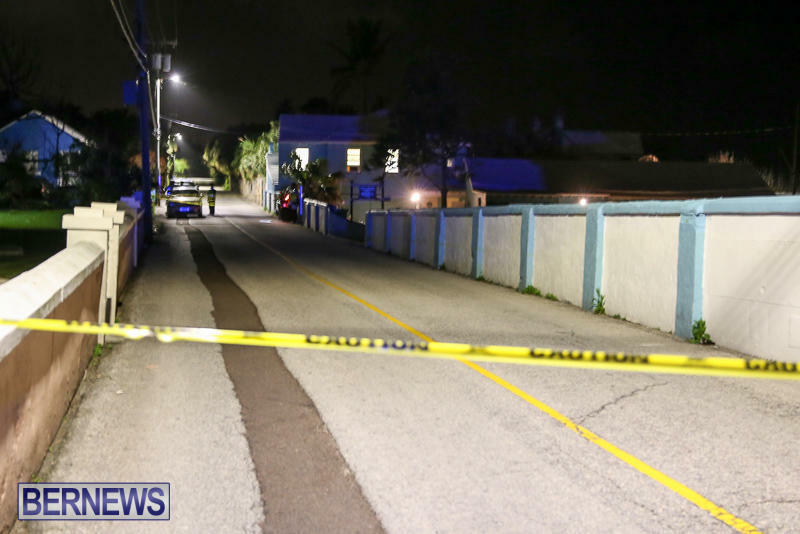 Update 1.39pm: Police Acting Detective Inspector Kenten Trott said, “The Bermuda Police Service can confirm the death of Jahni Terrence Kyle Outerbridge as the man who was shot last night at the Mid-Atlantic Boat & Sports Club, North Shore Road, Devonshire. “The death of Jahni is being treated as a murder investigation and on behalf of the Bermuda Police Service we extend our condolences to his family and friends. “Approximately 11:20 p.m. on Sunday 29th January, 2017, police received several 911 calls reporting a man had been shot in the parking lot of the Mid-Atlantic Boat Club. “Police officers and EMTs arrived shortly thereafter and rendered first aid to the injured man Jahni Outerbridge. Jahni was later transported to the King Edward VII Memorial Hospital by ambulance where he was pronounced dead shortly after arrival. “Jahni is 31 years of age and his death is the first murder of 2017 and the second shooting incident to have occurred within a week. “The investigation regarding the circumstances surrounding the murder of Jahni Outerbridge is being led by Acting Detective Inspector Kenten Trott and a team of detectives from the Serious Crimes Unit. “The focus of this press conference is to ask for the public’s assistance in capturing Jahni’s murderer and bring to justice the person(s) responsible. “We are aware that there were approximately 50 persons at the Mid-Atlantic Sports Club on the night of this shooting and in particular we are interested in speaking with persons that would have been in the parking lot of the Mid-Atlantic Sports Club at the time of shooting. “We are interested in speaking with persons that drove along North Shore Road from the western part of Spanish Point to Barkers Hill roundabout between 11:00pm and 11:30pm on Sunday 29th January, 2017. “We are also interested in speaking with persons that came into contact with Jahni on Sunday 29th January, 2017, until his death. “Bermuda has lost another young man at the hands of senseless unscrupulous men. “Another mother and father now have to bury their son and the extended family and friends of Jahni are grieving. “Jahni truly has gone too soon and as a community we are calling on you to help ensure that justice is served and that Jahni’s family have closure.